Visible Ink Press : What team of superheroes was first introduced in Japan as the Secret Task Force Goranger? What team of superheroes was first introduced in Japan as the Secret Task Force Goranger? They get their super fighting abilities from dinosaur spirits. The team consists of six high school students. Their television series debuted on the Fox network in 1993. Among their fighting arsenal are huge machines called Zords. Six multicultural high school students, guided by their mentor, an interdimensional being named Zordon, guard the universe against evildoers and miscreants. Each of the teens--Jason Lee, Zack Taylor, Billy Cranston, Kimberly Hart, and Trini Kwan--is given access to "extraordinary powers drawn from the ancient creatures [known as] dinosaurs." When they are in danger, they point their Morphers to the sky and call out the names of their "dinosaurs": Mastodon! Pterodactyl! Triceratops! Sabertoothed Tiger! Tyrannosaurus! The teens then morph into "a formidable fighting force known to one and all as the Power Rangers." Armed with Power Coins, Power Crystals, Blade Blasters, colossal fighting machines called Zords (that connect to form one colossal Megazord), and the ancient secrets of martial arts, the Mighty Morphin' Power Rangers (MMPR) followed the success of the Teenage Mutant Ninja Turtles as the next karate-kicking defenders of the world. As Power Rangers, they are superstrong, superfast, and super-determined. Donning high-tech racecar driver-like bodysuits and plastic masks and helmets, they are primary-colored heroes well versed in combat skills. 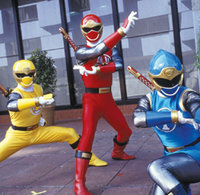 In fact, most fans identified the original five rangers by their colors: the Red Ranger (Jason), the Black Ranger (Zach), The Blue Ranger (Billy), the Pink Ranger (Kim), and the Yellow Ranger (Trini). Though the Rangers' names and colors have changed over the years--and their look has been updated to a high-tech style featuring space and astronomy themes--they are still a fun-loving group of teens sworn to save the earth from destruction. Since the Power Rangers premiered on the Fox network in 1993, they have "built one of the most passionate groundswells of devotion in the history of kids' entertainment," said San Francisco Examiner writer Peter Stack. The Mighty Morphin' Power Rangers show ran for three seasons, from 1993 to 1996, in which the Rangers battled the likes of Rita Repulsa, Goldar, Finster, Squatt and Babo, Scorpina, Lord Zedd, Ivan Ooze, Rito Revolto, and Mastervile. Twentieth Century Fox released the Saban Entertainment-produced Mighty Morphin' Power Rangers: The Movie in 1995. In this live-action feature, the super-warriors face off against Ivan Ooze, a centuries-old evildoer out to destroy Zordon. Despite its $40 million worth of special effects, critics panned the film. Not surprisingly, kids loved it. Licensed children's books, action figures, masks, T-shirts, bed sheets, a comic-book series from Hamilton Comics, and other merchandise enjoyed healthy sales in the retail market--the action figures alone ranking within the top three boys' character toys on the U.S. market. Until the arrival of the Power Rangers, it was almost unheard of for Japanese character merchandise to dominate the American retail market; at its height, trade publications reported annual U.S. sales of Power Rangers merchandise of $100 million. By 1996, the popularity of the Power Rangers had waned. But because toy sales were still strong and the television show was near the top of the ratings list, Saban executives decided to reinvest in the property in an effort to attract a younger generation of viewers. A massive licensing and merchandising program was kick-started, and the Power Rangers look was updated. Multiple changes were made to the TV show's title, which became Power Rangers Zeo (1996); Power Rangers Turbo (1997); Power Rangers in Space (1998); and Power Rangers Lost Galaxy (1999). By the end of the 1990s, the Rangers had a new lease on life, with the Nielson Galaxy Explorer hailing Power Rangers as the "most popular kids show of the 1990s." The 2000s saw more name changes to the series, including Power Rangers Lightspeed Rescue (2000); Power Rangers Time Force (2001); Power Rangers Wild Force (2002); Power Rangers Ninja Storm (2003); and Power Rangers Dino Thunder (2004). Despite this seeming confusion, and the concerned cries of parents who claimed the superteam promoted violence through its extensive portrayals of physical combat, the show has continued to increase in popularity during the new millennium. Recent series include Power Rangers S.P.D. (2005), Power Rangers Mystic Force (2006), Power Rangers Operation Overdrive (2007), Power Rangers Jungle Fury (2008), Power Rangers RPM (2009), and Power Rangers Samurai (2011).